Garden dining is made better at Botanico at The Garage, Botanic Garden's latest F&B establishment. There's none of the heat or humidity at the open bar of the restaurant (thanks to their strong AC in the open air area). 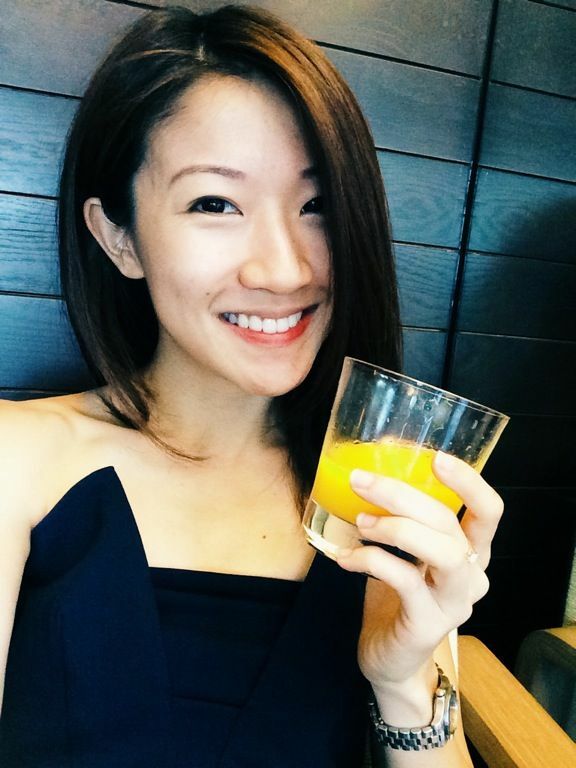 It is easy to forget that you are in Singapore given the elegant 1920s Art Deco setting, lush greenery, and temperate climate. 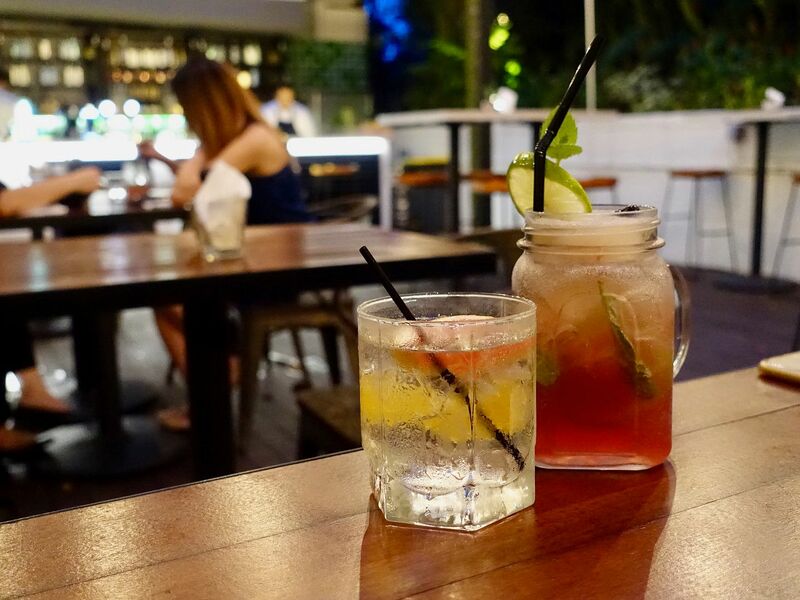 We headed out of the cozy indoor dining area to the outdoor terrace for botanical-inspired cocktails like Garage Gin’Onic ($16), Blackberry Lychee Mojito ($14), and Thyme Lemonade ($16). My refreshing elderflower flavored gin was gone in no time. We highly recommend dining in the open space instead (because it's much prettier and more romantic haha) unless it rains. Spanish-born Chef Antonio Oviedo, previously trained by Santi and the Roca brothers, delivers a seasonality-focused meal at Botanico. Here's a look at this season's best. 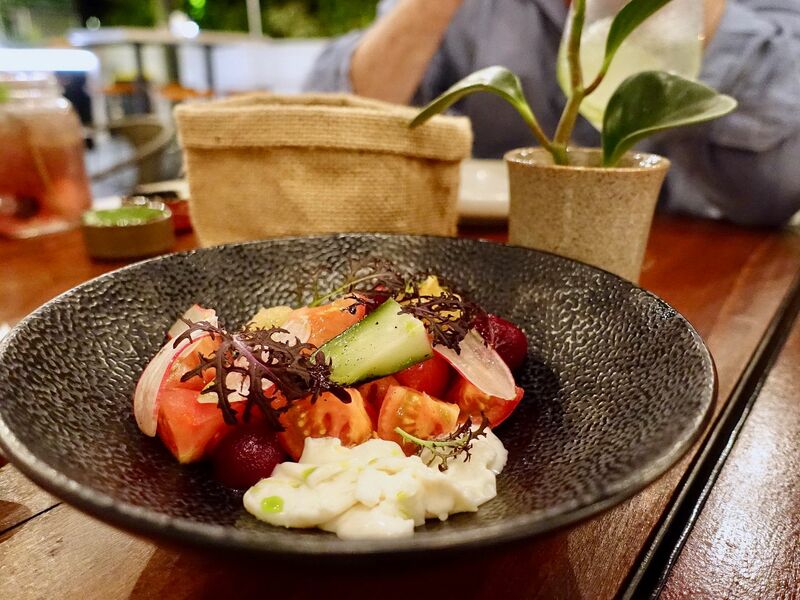 Start with the refreshing Botanico Salad ($18) which features Cañarejal cheese, a traditional raw unpasteurised sheep's milk cheese from Northern Spain; heirloom tomatoes from France; and a mix of pickled beetroot and seasonable fruits. The milky creaminess is paired with the robust sweetness from the greens (or reds if you insist). Another crunchy bite would be the Calamaritos ($12). 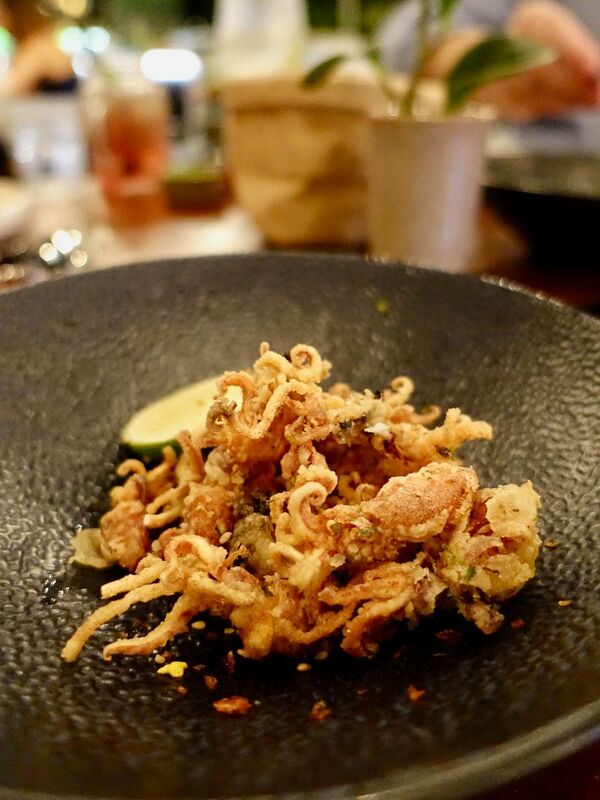 Fresh unmarinated baby squids are coated with tempura flour and deep fried. The airy crisps are good on their own, or paired with the fragrant seaweed aioli. 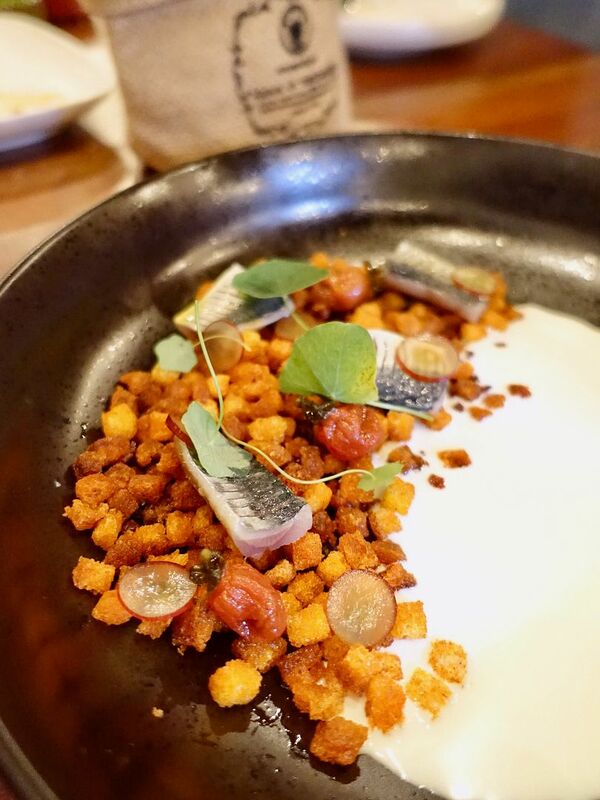 I'm not a fan of sardines due to its overpowering flavor but Chef Antonio has balanced that fishy flavor by smoking the Japanese sardines and pairing them with croutons fried in Iberico fat and chorizo bits!. How's that for an interesting Surf-n-Turf! The way to sample the Smoked Sardines ($20) is get a nice mix of the different components, including the sweet confit tomatoes and Ajo Blanco (an emulsion of almond, garlic and olive oil) and send them all into your mouth in one scoop. 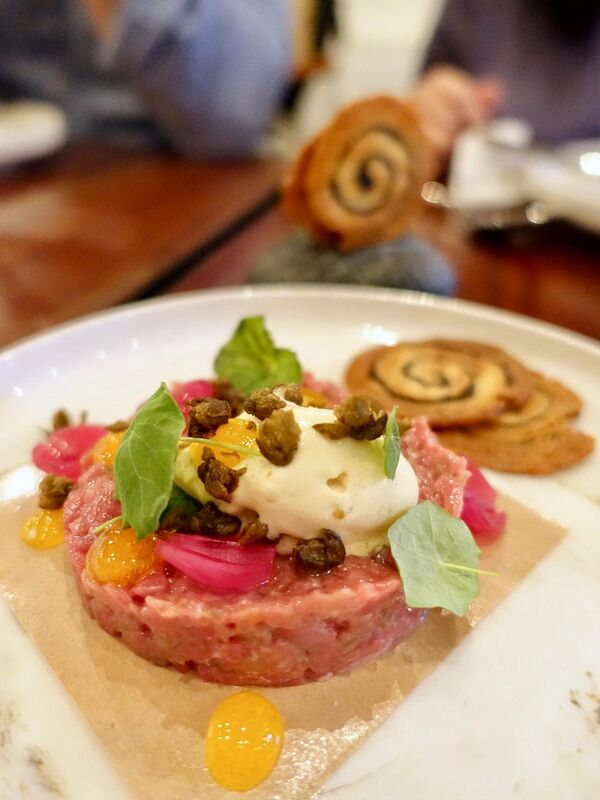 I've had carrot, tuna, horse, and beef tartare (each on different occasions) but Lamb Tartare ($20) is a first for me. I half-expected my mouth to be assaulted by a strong gaminess but the flavor was surprisingly mild and the gaminess cleverly concealed by the accompanying mustard ice cream, pickled onions, capers and black olive arlette. 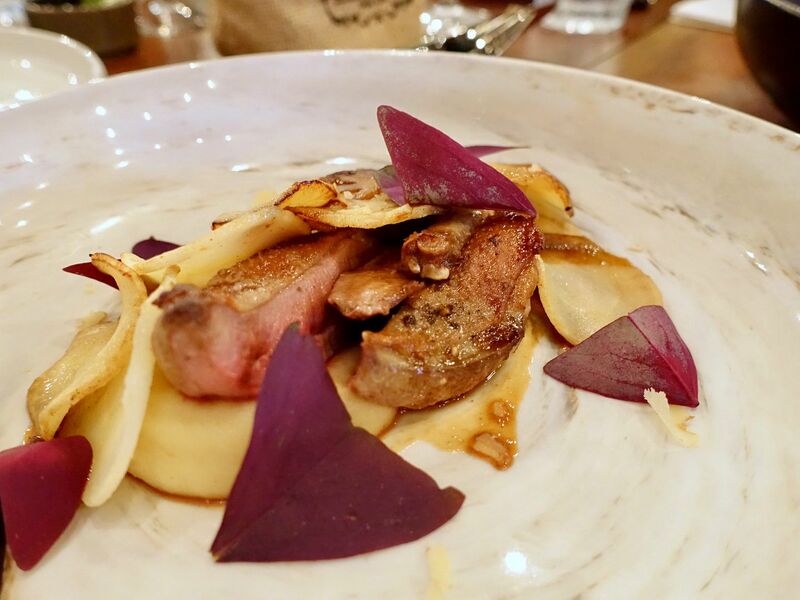 As if in an attempt to change the minds of Singaporean diners on strong-tasting meats, Chef presented us with his Roasted Pigeon ($27) breast served medium rare. I've no doubt that pigeon is best prepared this way and the meat was very tender (with a liver-like texture in fact), but it was still a little too bloody for me. It's not the pigeon's fault, it's just my bird phobia acting up. The seafood, i concluded, is the star at Botanico. The Chargrilled Carabinero ($34) from Spain had their sweetness sealed in their flesh from being grilled in the Inka oven. 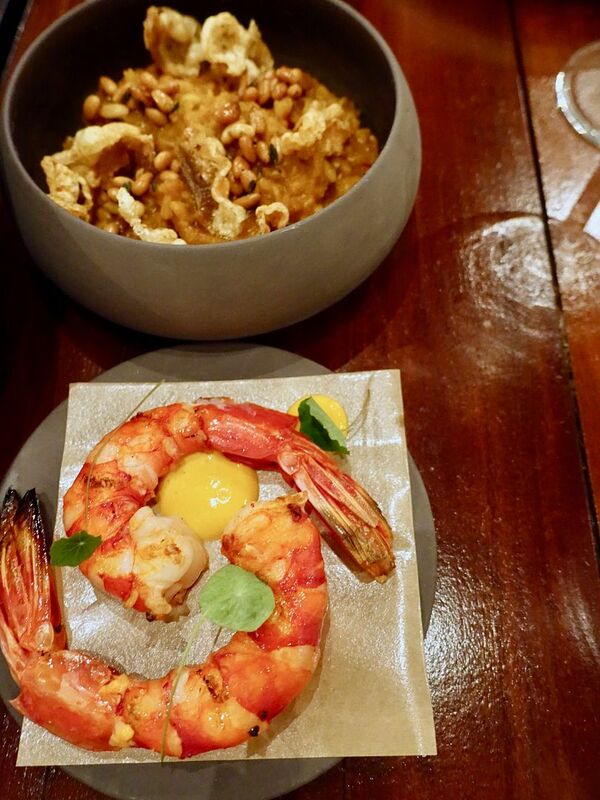 They are paired with a Bomba rice cooked in a rich prawn bisque made from the same prawns. Faultless intense flavors here, but we could do with a less mushy rice. 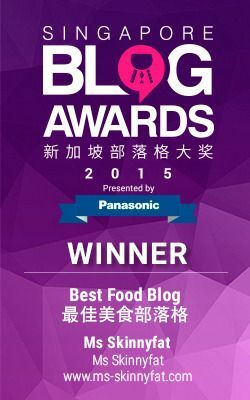 The icing on the cake for most would be the Chicharrón a.k.a. pork crackling (typically Spanish). 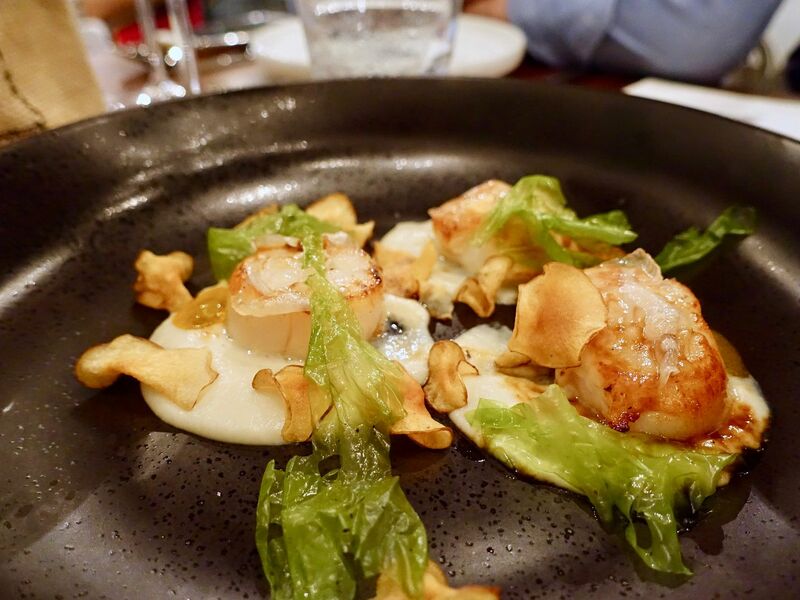 My favorite dish was the plump hand-dived Hokkaido Scallops ($27) with Jerusalem artichoke puree and crisps. Iberico lardo is added to enhance the flavor of the scallops (i think i see a strong Surf-n-Turf trend here). SUPER. Really. I believe that the Botanist could have its own desserts line if they want to. Hell! They've ruined all desserts for me. If you are a G&T person, you would certainly approve of the Botanist ($12). 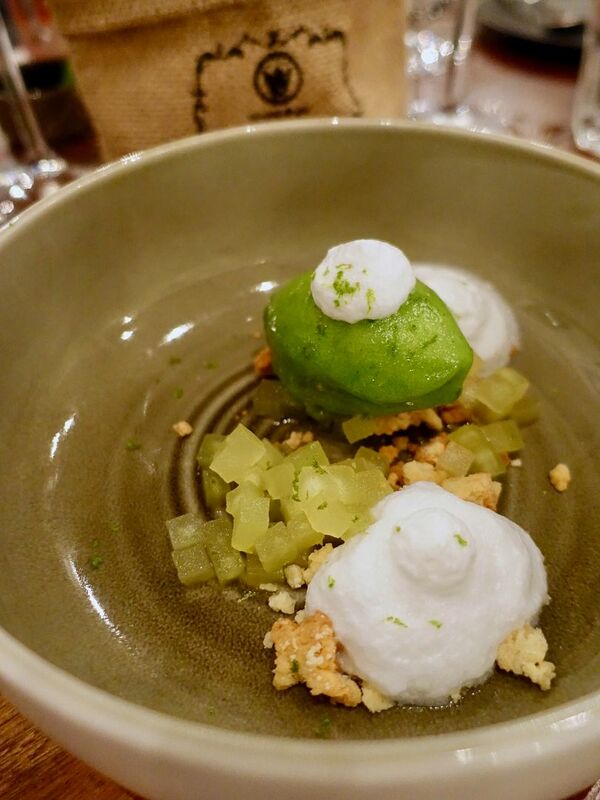 Compressed Granny Smith apple cubes are infused with gin and juniper berries, accompanied by an invigorating cucumber sorbet, and fragrant coconut sable crumble. This dessert will revitalize you after your walk in the park. 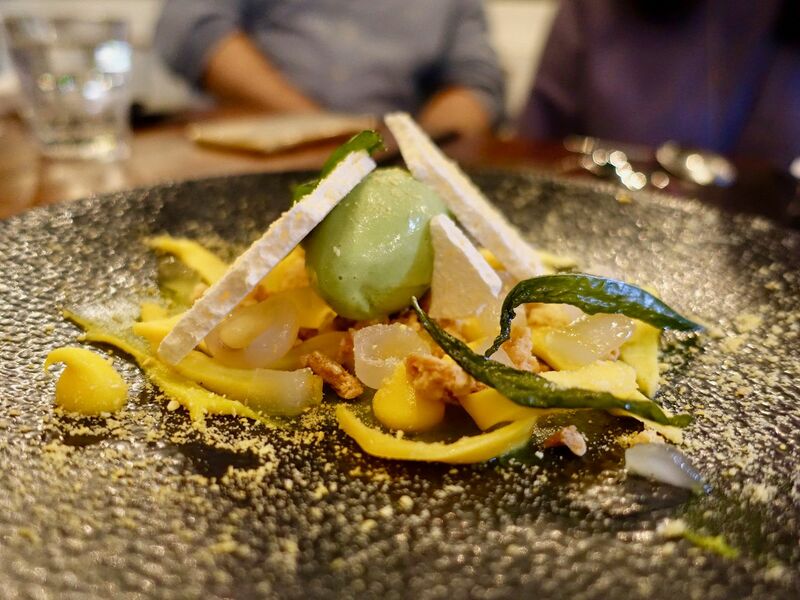 An out-of-this-world dessert is the Tropical Fruits ($14), which brings together the most unlikely local produce like laksa leaves, turmeric, sea coconut, jackfruit and longan on one plate. You'd either love it or hate it, like how one may react to licorice or basil in a dessert. As for me? LOVE IT. The good-ol chocolate dessert is made more interesting at Botanico. 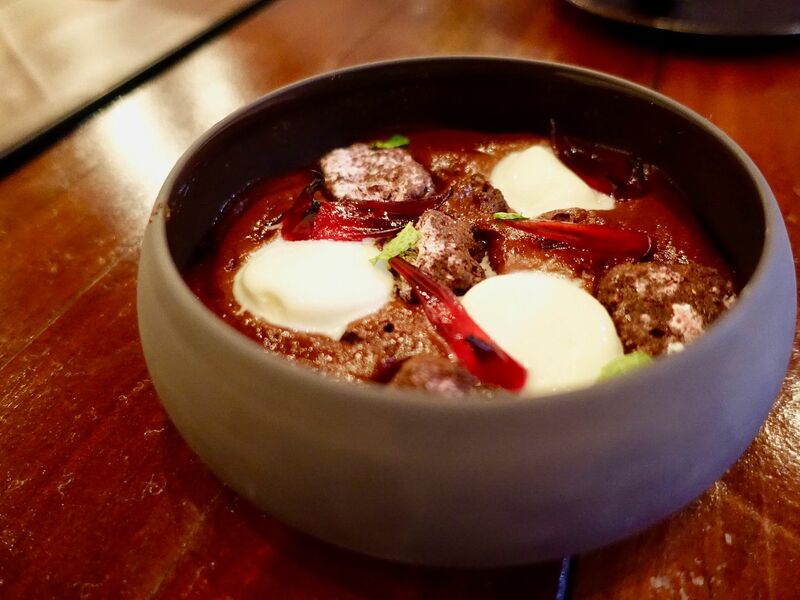 The Ceiba ($14), a warm organic chocolate foam from Dominican Republic is spiced with ginger ice cream and dehydrated brownie croutons and compressed hibiscus powder. This is the elixir of life. We were wowed by the interesting dishes at Botanico at The Garage and we could certainly see repeated trips back to this lovely spot. Psst, we also had a really delicious Bastianich Vespa Rosso 2012 to end our night. Time for that romantic nightcap i think!